Éric Briffard has been Executive Chef and Culinary Arts Director at Le Cordon Bleu Paris since January 2016. Assisting him are Chef Philippe Groult for cuisine and Chef Fabrice Danniel for pastry. Chef Briffard firmly believes that there is no greater satisfaction than giving ones very best. With more than 35 years experience in the world of gastronomy, this “Best Craftsmen in France (Un des Meilleurs Ouvriers de France - MOF) 1994” has received numerous awards. Amongst others, he was named “Chef of the Year 2010” by the Pudlo guide, was awarded four toques by the Gault & Millau guide and the top prize for his book “Éric Briffard Le Cinq” (published by Glénat). In 2016, Chef Briffard was awarded the “Grand Vermeil” medal, the highest distinction from the city of Paris. Born in Auxerre in 1961, Chef Éric Briffard’s native Burgundy taught him to appreciate the natural taste of a product and terroir. 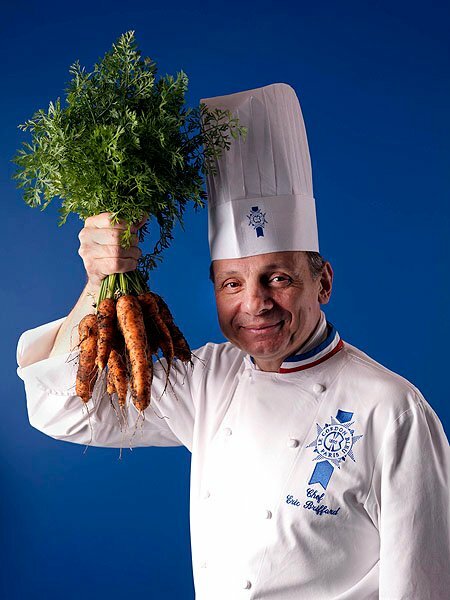 His culinary training began at the age of 15 when he began an apprenticeship with Michel Moret, at the Relais Saint-Fiacre, in Appoigny. He then followed his culinary calling, entering the Compagnonnage (craftsman’s guild) in 1976 and working alongside Joël Renty (Concorde Lafayette Hotel Paris), then Marc Meneau (L’Espérance, Saint-Père sous Vézelay) and Philippe Groult (Manoir de Paris). At the age of 28, he headed to Japan where he took on the role of cuisine Chef at the Royal Park Hotel restaurant, Palazzo, in Tokyo. He returned to Paris when Joël Robuchon chose him to become cuisine Chef of Jamin restaurant. A few years later, in 1991, Éric Briffard decided he wanted to cook his own style of cuisine and made his mark at the one Michelin-starred Château de Fère-en-Tardenois. He then took over the running of the kitchens of the Plaza Athénée hotel and of Le Régence restaurant. Voted “Most promising Chef of the 21st century” by a jury of French gastronomic press columnists in 1999, he went on to be awarded 2 Michelin stars in 2000 and repeated this feat in 2007 at Les Elysées du Vernet restaurant, in Paris. In 2008, Éric Briffard took over the running of the Four Seasons Hôtel George V kitchens in Paris and was once again awarded 2 Michelin stars at Le Cinq.